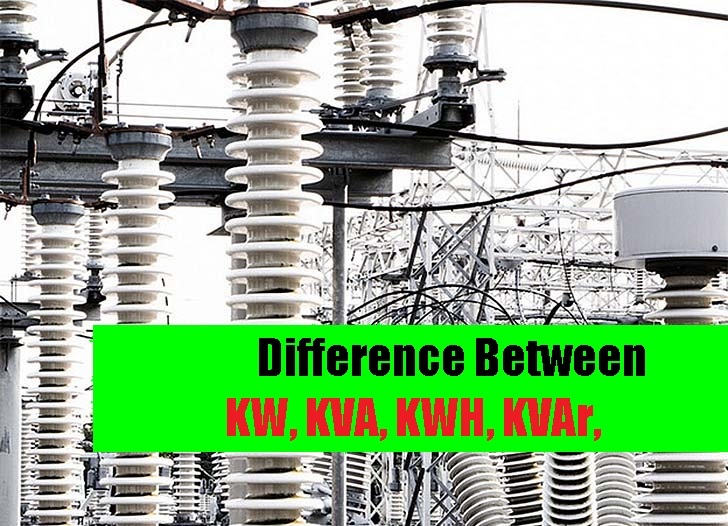 What is definitions of KVA, KW, Watt, KWH, KVar, and what are the differences? 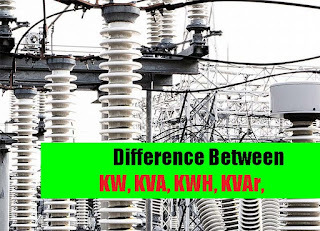 Maybe we have encountered an electricity unit that is sometimes written by using Watts, KW, or KVA, And this is often a question for us, what exactly is the difference between KW and KVA units, and how much is 1 kVA, or maybe what is the 1 KVA KW? In addition, we also often hear the term KWH, then the question, 1 KWH is how many Watts, or 1 Kw how many KWH? To answer these questions, the following is an explanation of what is meant by KVA, KW, Watt, KWH, Kvar, and what the differences are. What is meant by KVA, KW, KVAr, and KWH? KVA (Kilo Volt Ampere) for electrical power that is not too large it is usually enough to use the VA power unit (Volt Ampere). KVA is a unit of electric power obtained from the calculation of the power formula, or commonly referred to as Nominal Power (written power). The amount of Power in KVA units is not yet the actual power, so the Total Power in KVA units is called the apparent power. KW (Kilo watts), for units of electrical power whose value is smaller enough to use units of W (Watts). KW is a unit of electrical power obtained from the results of apparent Power (KVA) with a power factor (Cos-phi). The amount of power in units of KW is the actual amount of power, so the power in units of KW is usually called Active Power (KW). Sometimes the question, 1 KW = ..... KVA? To find out the results, it must be known what the value of Cosphi or the power factor of the installation or electrical device. For the value of cosphi = 1, then 1 KVA is equal to 1 KW. KVAr (Kilo Volt Ampere Reactive), or in smaller units usually uses units of VAr (Volt Ampere Reactive). This KVAr is a reactive power unit, which states how much reactive power is produced from various electrical equipment used, the greater the reactive power will have the greater the loss or difference between the apparent power and the real power the greater. KWH (Kilo Watt Hour), is a unit that states how much power is used in an hour, with the amount of electrical power is Kilo watts. 1 KWH is the use of an electric appliance with a power of 1000 Watts (1 KW) in an hour. So if the question is 1 KWH = .....Watt? Of course there is no answer, because to answer this question you have to know how much electricity is used and how long it will be used. Is 1000 Watts = 1 KWH? Not necessarily, if an electric device with an electric power of 1KW (1000Watt) is used in 1 hour, then the result is 1 KWH, but if 1000Watt power is used for 0.5 hours, then the result is 0.5 KWH. So, to find out the value of KWH, two things we must know, namely, the amount of electrical power and the duration of use. For example, if a power plant has a power of 500KVA, with a Cosphi value of 0.8, what is the KW power plant? So a generator that is written 500KVA only has a maximum power capacity of 400KW. For example, an electric device of 250 watts is turned on for 2 hours, how many KWH? So an electric device with a power of 250 Watt (0.25 KW) is turn on for 2 hours, then the KWH value is 0,5 KWH.